It’s been a while since a restaurant serving foreign cuisine made a serious play for best restaurant in the city. Not just best food, mind you, but finest dining all-around, with all the ambience, decor, service and prices that implies. For years that sort of thing was the preserve of French restaurants; then Northern Italy had a moment. But since the triumph of “fresh and local” cuisine, the most desirable tables in Pittsburgh have been at a series of American restaurants serving haute comfort food or something more experimental. Now Yves Carreau, who got established here at Sonoma, and has had buzzworthy success at Seviche and NOLA, is making a play for the prize with a Greek restaurant that spans from Market Square to PPG Plaza. It’s a dazzling, sprawling space that ranges from bright bar and lounge on the Market Square side to dimmer dining room facing the PPG rink, plus a couple of semi-private rooms behind sliding panels of glass. The decor might be described as “marine modern,” with sophisticated shades of sand-white and deep green-blue recalling Aegean shores and sleek, undulating lines set off by rustic touches such as the netting-covered globe light fixtures and glass vases of seashells. There are also extensive decks for outdoor dining. It’s all very impressive. Facing the lobby, at the helm of the long open kitchen, all of the day’s seafood is on ice in a large display case. Poros’ commitment to fresh seafood is embodied in a “fish market” section of the menu from which various sizes of whole fish, filets and shellfish can be combined with one of three basic preparations: grilled, pan-roasted and tandoor-roasted. Prices are by the pound, ounce or piece, respectively, and customers are encouraged to try an a la carte approach to compose their own mixed plate. The fish market also includes three chef’s specialties, or complete dishes. Angelique chose the samke harra salmon, grilled on cast iron with olive oil, sea salt, and black pepper. It was served with a Lebanese sauce of tahini, garlic, lemon and pine nuts on a bed of lightly wilted dandelion greens and horta, or Greek greens. The salmon was rosy, tender and flaky; the sauce both nutty and pungent; and the greens themselves a flavorful component to this excellent dish. The rest of the menu spans the Mediterranean region, adding Middle Eastern and North African flavors to the core Greek offerings in both mezze (small) portions and entrees. In addition to the emphasis on fish and shellfish, there are a significant number of lamb options, plus a respectable array of vegetarian and vegan dishes. Of the mezze, lamb carpaccio and grilled octopus were both magnificent. In the first, thin, not-quite papery slices of Jamison Farm lamb were drizzled with a subtly spiced harissa and served with white beans and frisée. In the second, a long, narrow platter arrived topped with smoky, tender tentacles interspersed with grilled fennel and radicchio, all brought together by an herbal parsley sauce and shallot and caper citronette. The one was a relatively simple dish that focused on its main ingredient, the other an elaborate interplay of components, but both wowed us with top-tier ingredients and a confident mastery of flavors. Turkish borek was more strictly traditional. Borek is pastry rolled around lamb and beef — a bit like a large spring roll, but here the wrapper floated between crispy and crunchy, more substantial than phyllo, but lighter than any dumpling wrapper. The meat, chopped, not ground, was tender and savory; sultana raisins were subtle, and the whole was fine, if not extraordinary. Shrimp saganaki, in a roasted-tomato coulis topped with feta, was prepared so that some of the cheese melted into the sauce while leaving some crumbles atop. This lent extra pleasure to scraping it up with crusty bread, which sadly ran out before the coulis. The three shrimp, generously sized, were plump and firm, continuing the kitchen’s strong meat technique. That technique faltered, though, in Cretan roasted chicken, where a chicken breast that was neither dry nor succulent sat atop wonderfully roasted potatoes, dark cipollini onions, and a tentative combination of lemon and ricotta. The kitchen recovered its footing with Jason’s a la carte scallops. Large but not massive dayboats, they were sensibly seared on one side only to prevent overcooking, resulting in flesh that was almost as sweet as sashimi-style scallops, yet warm and richly flavored by the light crust. There’s nowhere to hide subpar ingredients or technique on a plate this spare, and Poros pulled it off with perfection. 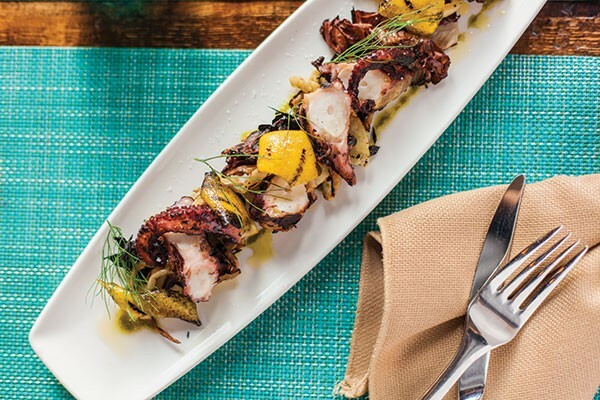 Poros’s almost flamboyant elegance and flawless mastery of seafood have elevated Greek cuisine to a level of sophistication previously unknown in our city.